There was no controversy this weekend and no question who is the man to beat in the 2014 West Coast 250 Championship. 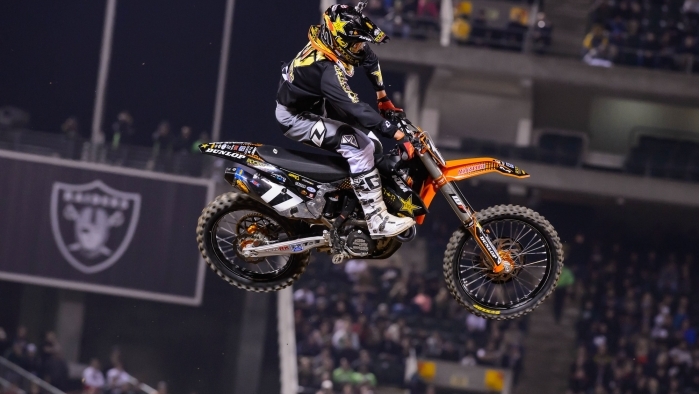 That is none other than Rockstar Energy Racing's Jason Anderson who picked up his 3rd win in 4 races and put the red plate back where it belongs, on the number 17. Jason Anderson was definitely not happy the Saturday night after A2 when he learned of his penalty docking him 2 positions. However not unlike a Professional Quarterback in the NFL, you have to have short memory when adversity strikes and simply move forward. By Monday morning Jason was at the test track, back on his program and preparing for the short trip north to the bay area with the past behind him. It was evident in practice that his focus on the championship was unwavered. Anderson and Dean Wilson were blazing fast in practice. In fact the duo posted lap times quicker than any of the 450's. The stage was clearly set for a battle between them. Jason once again claimed victory in his heat race for the 4th consecutive time this year, in as many attempts. Exiting the first turn in the main event, both were near the front and fell in behind Justin Hill. The three front runners engaged in a fierce battle for the lead with nobody wanting to relinquish any ground. Finally Anderson moved by Hill, but also left the door open for Wilson who suddenly moved straight from 3rd to 1st. JA got in behind him and they began to negotiate lappers. He closed the gap considerably and got right on Wilson's rear tire who then experienced some sort of brief minor hiccup that looked to be mechanical. It was just enough to let Jason by and claim the last lap win again! It has become clear that the #17 can never be counted out of any race. Jason Anderson: "Weekend was good. I had another last lap pass annndd (laughs) it was awesome. 3 wins on the season so far and you can't beat that. I just need to stay in it and keep doin my thing." Ivan Tedesco definitely put in a lot of laps on the track in the O.Co Coliseum. 3 practices and 4 races to be exact. For the first time this season he was forced to go to the LCQ. He looked to be qualifying easily out of the semi, until near the end of the qualifier he caught his foot on the face of the finish line double sending him sideways and tumbling to the ground. Fortunately he was unharmed in the incident, but unfortunately he missed getting into the main by one position. He then won the last chance qualifier easily. Tedesco certainly had enough laps to have the track dialed but facing him was the 20 lap main event and he was going to be lined up way on the outside. He squeezed around turn one safely but was near the back. He worked his way up through the field but began to run out of steam in the waning laps. He was able to match his best finish of the season however and through everything overcome on the day, that shows his continued progression to return to form. Ivan Tedesco: "The day went ok. Practice was a little rough the same as it has been the past few weekends. It's taking me a little while to get used to the tracks. It gets better every time I go out there. I got plenty of track time tonight going to the LCQ. I put it in the main and got another bad start. I just clicked off as many laps as good as I could and I ended up 12th. It's getting better and we'll keep workin at it." The team will now prepare for the final trip of the year to Angel Stadium in Anaheim. Anderson who now has a 6 point lead will look to extend it, Tedesco will shoot for the top ten once again and also try to cut the gap to 10th in overall points, which he coincidentally sits 10 points out of.